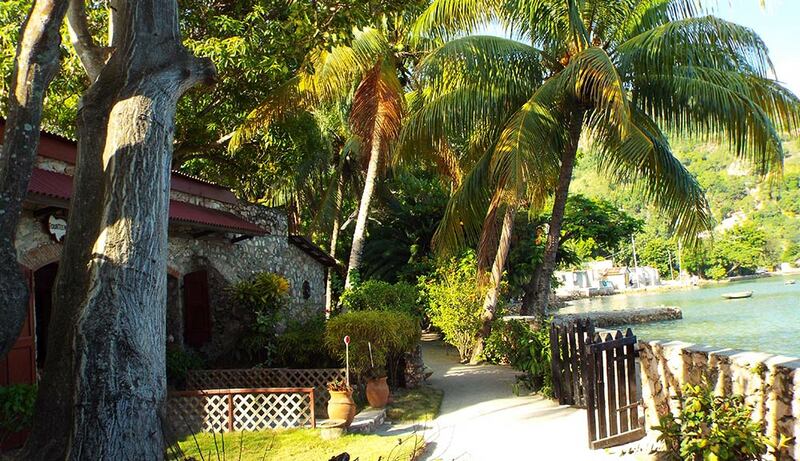 Norm’s Place is a rustic retreat located in Labadee (Labadie) Bay, Haiti. When we finally arrived at the water taxi area in Labadee it did not take long to arrange transport over to the hotel dock. The ride over the mountain from Cap Haitien was enjoyable to say the very least. The views of the Haitian north coast as you descend closer to the ocean is reminiscent of other gorgeous Caribbean locations. There is also a familiar resemblance to the north coast of Durban, South Africa near Umhlanga Rocks. The water taxi captain nosed up to Norm’s dock and we stepped off the bow of the boat. Norm’s Place is located in a picturesque location in Labadee Bay with a commanding view of the village further down the bay, and the Cruise Ship dock that is also in the distance. Your first impression will be that you have found a place where you will be able to relax and forget about your mobile telephone and wireless devices. From the dock to the hotel’s Great Room are only a few steps. I was immediately captivated by all of the old world Haitian furnishings, art and bric-a-brac. As a guest, the history of this location makes for stimulating musings. The location’s unique history is worth exploring. The location was said to be a colonial house for several generations, and also an industrial works where stone masonry blocks were carved out of the hillside, treated with sugar cane syrup and the blood of animals then baked and tempered in a huge oven called a “Lacho”. As you explore the grounds of Norm’s Place there is ample evidence of all these histories preserved and blended tastefully in an eco-friendly environment. Norm’s Place provides eight unique rooms that feature equally neat outdoor areas complete with sand walkways, grass lawns, palm trees, many varieties of tropical plants and trees and perfectly placed hammocks. The old world theme carries through to each room which feature mahogany screened beds, tiled floors, and huge plantation type windows and doors. The electrical service is 110V, 60 Hz and it was available the entire length of our stay. Each room is also furnished with large ceiling fans and kerosene lamps. The toilet areas are more than adequate with a shower, running water (not heated), and those huge Caribbean style windows. After being greeted by three housekeepers we were asked to provide meal requests from the hotel menu and any special needs that would make our stay happier. Without exaggerating, these housekeepers were consistently friendly, attentive and served delicious meals daily. We spent several wonderful days eating fresh seafood, sleeping, reading, hiking up the mountain behind the village, sailing day trips to nearby cays, and was even invited to a vodou party.